Peli cases are renowned for their high quality, durability and dependability in extreme conditions. Offering watertight, dustproof and crushproof security, Peli Protector Cases are sealed (to IP67) against moisture ingress and are tested to military standards, most models have Nato stock numbers. As the market leader in ruggedised protection, film and broadcast professionals have chosen Peli Cases for many years for their outstanding performance in the harshest conditions. The jungles of Papua New Guinea tested the equipment, including Peli cases, used by Patrick Hutton and Richard Johnson during their 2014 expedition in aid of the PNG focused charity 'ChildFund'. The pair walked and paddled from the Northern coast to the Southern island of Daru using only 'human power', and carrying all their vital supplies and filming equipment. Peli cases were central to the protection of their vital hard drives and memory cards throughout the expedition. The versatility and ruggedness of the products was appreciated by the team "We were both massively impressed with all the units we took with us, without them we are confident the footage would not be back safely in the UK." Patrick and Richard used Peli 0915 and 0945 memory card cases along with Peli 1020 Microcases for their hard drives and 1050 cases for peripheral equipment. 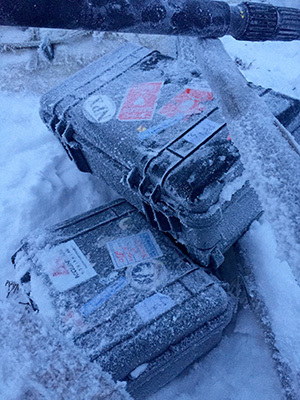 From the monsoonal rainforests of Papua New Guinea to the Arctic wastes of the Siberian tundra, Peli cases perform in all conditions as Producer/Director and Cameraman, Alexis Girardet explains "The key to working in these extreme and remote locations is protecting your kit against the multitude of conditions that are faced on a daily basis. I've been using Peli cases for years now and nothing has even come close in terms of protection and sheer quality. I know I can pack the most delicate of camera kit in a Peli case and then forget about it until needed. Not once has it let me down." Peli Products (UK) have invested in developing their protective packaging services and now offer a wide range of specialised foams to suit individual packaging and protection requirements. Protection is vital when transporting products or components, ensuring items reach their destination in perfect condition. Custom foam is extremely durable and ensures the contents are well organised, kept in their place and are fully protected, making them deal for a wide range of film and broadcast equipment. Bespoke foam inserts are used with Peli cases by Polecam Ltd, World Leader in Specialist Jibs, Minicams & Accessories. The Polecam Professional Pack (PPP) is contained in 2 Peli cases; the 1770 and 1600 models (excluding tripod and dolly). The components of the PPP are held securely in place during transit in the custom foam. The waterproof, crushproof Peli case ensures the Polecam kit reaches the location in perfect condition. Steffan Hewitt, Director of Polecam, has used Peli cases for more than 20 years. "Peli is an internationally recognised brand and product. The worldwide warranty offers unrivalled back-up and support. We have first-hand knowledge that if anything on the Peli case is broken in transit, it is replaced with no quibbles. For a jobbing cameraman that level of support is second to none. Wherever you are in the world, the Peli case does the job." Peli cases are backed by legendary "You break it, we replace it" lifetime guarantee.